Oversupply in Indonesian feedlots continues to push slaughter prices lower with the annual import total reaching 545,000. The AUD is weaker against all our Asian customer currencies helping in a small way to offset the sharp rise in feeder cattle prices in northern Australia. The impact of the very large number of feeders imported in August (70k) continues to depress the already oversupplied slaughter market with discounts pushing prices further downwards. This oversupply will soon be compounded by the output from the massive 81,000 head of feeders imported during October. The price range for slaughter steers in December starts with Rp41.500 per kg live weight as the highest quote while Rp38,000 was the lowest that I have heard reported. I have used Rp40,000 as the indicator rate for December. The traders that I have spoken to advise that even the lowest prices have not been able to move as many of the longfed animals as they would have liked. With a massive bulge of finished October imports heading for this very weak market, the slaughter price appears set for further punishment through January and February. 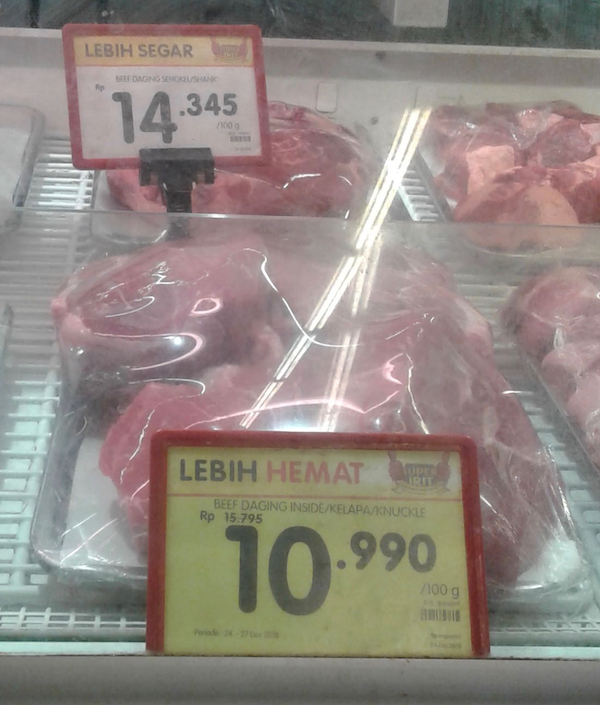 This selling pressure might account for a few major discounts seen in some Jakarta supermarket chains this month. See photo below of knucke reduced by more than 30% from Rp15,795 to Rp10,990 per 100 grams. 45,000 head of feeders were imported in November with 40,000 delivered during December bringing the total imports for the 2018 calendar year to 545,000 or an average of 45,400 per month. Given today’s domestic market signals for fresh imported beef, this number appears far too high with a monthly average figure between 35k and 40k looking much more sustainable. I spent a few days holidaying in southern Lombok recently and was surprised by the large numbers of buffalo grazing extensive pasture areas along the southern beaches. Southern Lombok was not severely affected by the recent earth quakes as the northern regions so tourism is still quite strong. While there is a great deal of new tourist accommodation being constructed, the majority is very sensibly located on tsunami-safe higher ground as can be seen in the photo below. Southern Lombok has very large numbers of buffalo grazing on the pastures and crop stubbles of the coastal plain while the tourist developments are located safely on the hillside. The audits of the importer performance against the 1 breeder to 5 feeder requirement have been completed by the government which simply needed to look back at the import permits which they issued for feeders and breeders for each importer entity during the last 2 years. Only one small new entrant to the live import business is likely to have satisfied the formula so everyone is now waiting of the government to announce their response which will be big news when it breaks. Feeder cattle prices moved sharply higher in northern Australia during December with rates for steers delivered Darwin rising from around $3.05 to $3.25 per kg live weight. Market observers tell me that this is mainly a function of a sudden shortage of supply which appears to have caught the market a little off-guard rather than any increase in demand. The sudden drop in the AUD against all of our Asian customer currencies is no doubt welcome but unfortunately for Indonesia will not be sufficient to offset the rising CIF price which will need to be paid in January and early February to allow feedlots to stock up for the peak annual demand of Ramadan (May) and Lebaran (5-10th June). All slaughter cattle prices across Vietnam remain the same strong values as last month with the change in the AUD figure above entirely due to the weakening AUD$. Fat steers in the south are selling for 70,000 VND while similar steers in the north can attract up to 76,000 VND. December shipments delivered cattle to all areas of the country including central Vietnam with inventory at the end of December increasing to around 70% of the 100,000 head national capacity. The 2019 Tet national holidays falls from the 2nd to the 10th of February so exporters and importers will probably have a busy January ensuring stocks are adequate for Vietnam’s cashed-up and food-loving population. With Vietnam’s economy one of the strongest in the world, the prospects for ongoing business in 2019 are looking bright. In fact, all the S. E. Asian economies are standouts when compared with the forecast performance for the rest of the world. 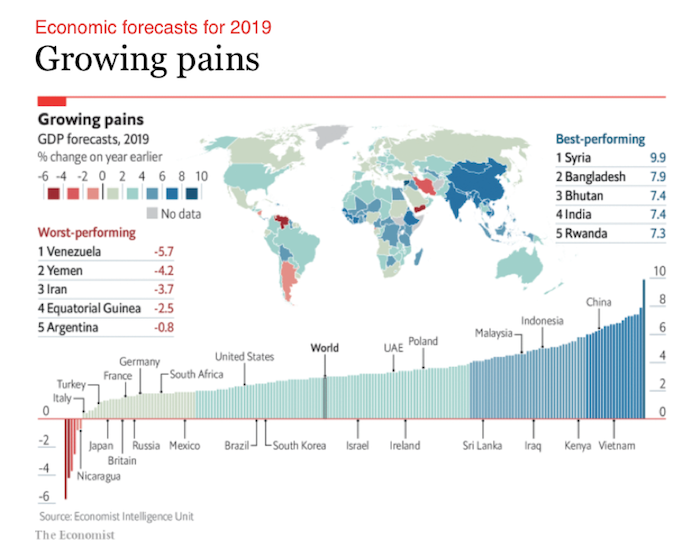 The Economist Intelligence Unit has recently published its GDP growth forecasts for 2019 predicting that all of our customer countries are expected to be amongst the best performers as shown on the graphic below. Rates for slaughter cattle in Beijing and Shanghai were steady during December. Once again, the slight change in the AUD figure above is mainly due to the weakening AUD. My agents report that although there have not been any major moves in retail prices there have been significant price increases in the wholesale beef sector especially for low quality product. Could this be a result of the major slowdown in the grey trade, especially from India, as reported recently by Simon Quilty? If so it may soon work its way through the supply chain to push retail prices higher. During December I visited south west China, flying into Kunming then sailing down the Mekong river through Myanmar and Laos until reaching the Golden Triangle where where I left the boat in northern Thailand. I will be writing a separate article on this fascinating adventure in the next few weeks. 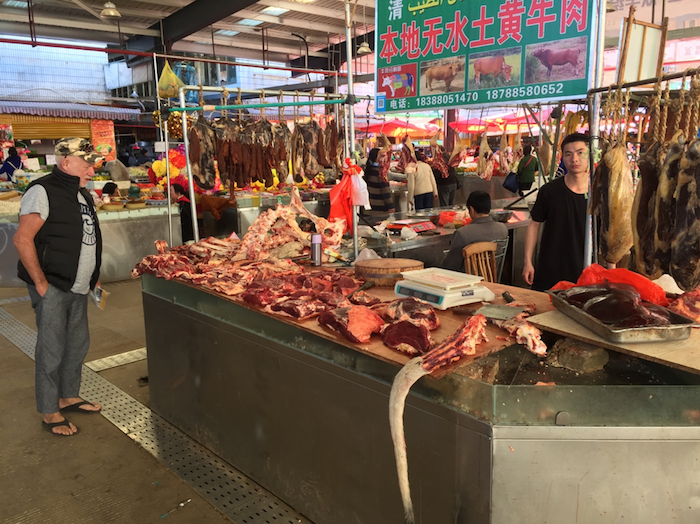 While in Kunming I naturally visited some beef markets including the largest wet market in this city of 10 million people. What an eye-opener. The wet market was extremely clean, orderly and well managed with an enormous array of food products for sale. Pork is of course the main meat available but beef is well represented with comprehensive displays of meat and offal as seen in the photo below. One product commonly sold here which I don’t usually see in wet markets in other parts of Asia is large cuts of salted beef. This product was selling for Y98 per kg ($20 per kg). Kunming is latitude 24 degrees north so the weather is cool and the wet market stays open all day with product surviving well in the open air. The pork areas were huge but many tables were empty. Unfortunately, due to translation difficulties, I was unable to determine if this was a result of the African Swine Fever outbreak or other factors. See Simon Quilty’s detailed discussion on the ASF situation which suggests that there could be a lot more market disruption to come. My travelling companion Mouse Sullivan, an Aussie expatriate from Bali inspecting the beef on offer. Fresh beef was selling for Y68 per kg which is in between the prices I have recorded for Beijing and Shanghai. Note the little blue square on the bottom left corner of the sign indicating that this business (as they all did) was able to process your purchase digitally using Alipay (blue square) and WeChat (green) on your smartphone. 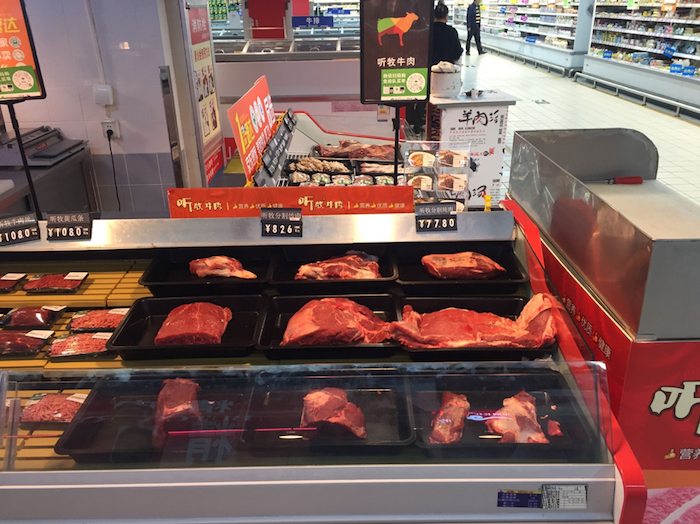 Supermarket in Kunming providing a modest presentation of fresh beef and offal at prices in the same range as those reported from Beijing and Shanghai. The Peso price of slaughter cattle remains the same this month (about 157 Peso per kg live) with the large increase in the AUD price above due to the weakening AUD$. This relative strength of the Peso, the forecasts for very strong GDP growth and the continuing strength of the local cattle prices should give Australian live cattle exporters further encouragement that this market may once again become a significant customer for Australian feeder cattle in the near future. Thai slaughter cattle prices have weakened during December with steers selling at THB91 while bulls were THB94 per kg live weight. After leaving the Mekong river boat in northern Thailand we travelled to Bangkok and visited some large supermarkets where this “The Beef Master” restaurant and retail butcher combination was doing a roaring trade in the MBK Centre. 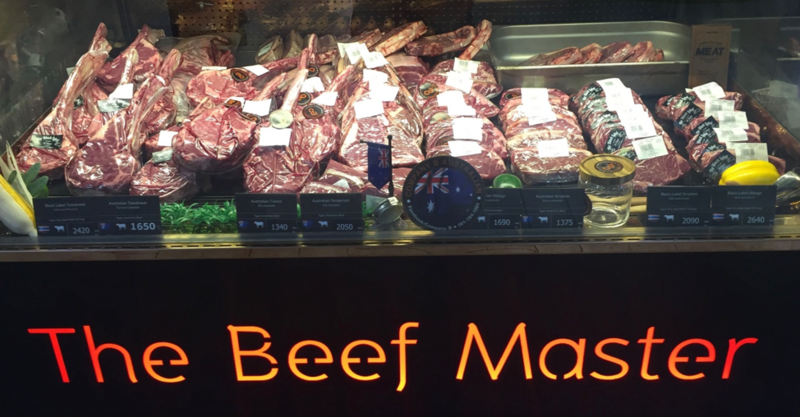 Their advertising explains that the beef is derived from imported Australian cattle which are fattened under the best conditions then processed for maximum eating quality including a final 55day dry aging for some cuts. The beef looks great and tastes good too. Prices for this Australian live import sourced product are steep, starting at the top with 55day dry aged “Black Label” Tomahawk @ Bht2420 per kg or AUD$103.86. Non dry aged Tomahawk @ Bht1650 or $70.82, T-bone @ Bht1340 or $57.51, Tenderloin @ Bht2050 or $87.98, Rib Eye @ Bht1690 or $72.53 and striploin @ Bht1375 or $59.01. 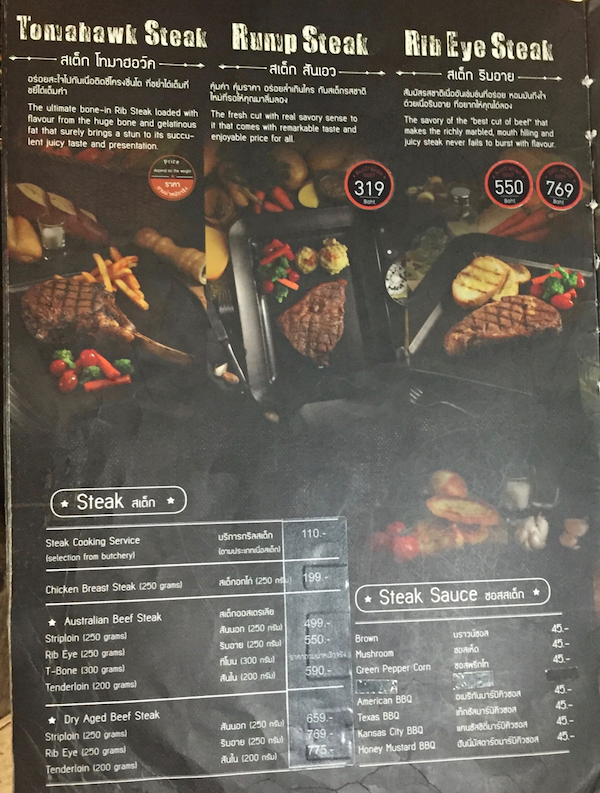 Their restaurant menu provides some reasonable prices with the more expensive products cut to order. Someone had taught the chefs well as the final eating experience was excellent. It is also possible to buy a cut from the butcher shop and have the chefs cook it for you on the spot for an additional charge of $4.70.